It didn’t take long for her to answer that question. That summer of 2013, CCBR launched a campaign called the “Face the Children” Project, which targeted politicians who had voted against protections for pre-born children by putting postcards exposing their pro-abortion position in the mailboxes of their home ridings. Then-MP Rick Dykstra, who had run as a pro-life candidate but promptly voted against opening the abortion debate once he secured his seat in Parliament, was one of the politicians selected, and groups of young volunteers hit the streets of St. Catharine’s, dropping postcards with photos of aborted babies contrasted with Dykstra’s voting records in every single mailbox. Vanessa joined the volunteers—at that point, she was one of the youngest activists on the street. She didn’t stop there. With the support of her family—Vanessa is the third of five siblings—she joined a new group set up by Tim Sinke, another student of Jordan Christian who had been inspired to bring the truth about abortion to his community after a CCBR high school presentation. 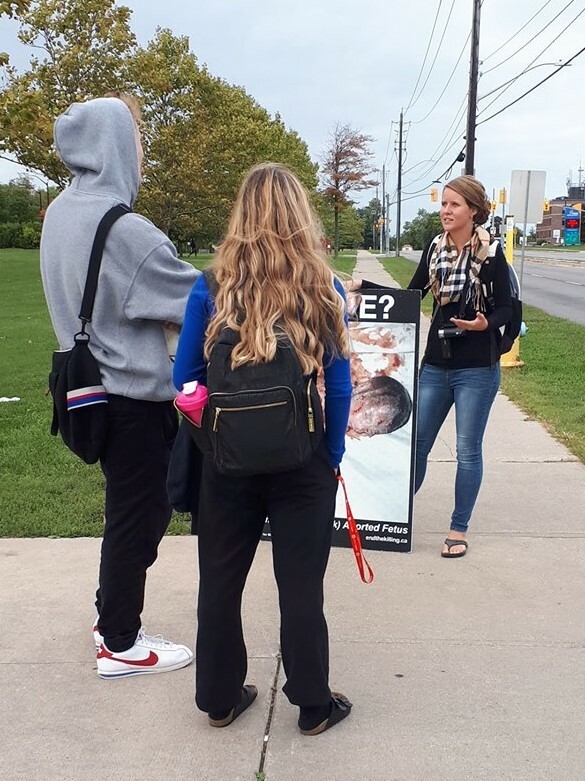 The group called themselves Niagara Against Abortion, and they began to do regular outreach throughout the St. Catharine’s area. Despite occasionally violent backlash, teams of dedicated pro-life activists of all ages braved the weather and profane abortion supporters several times a month—and saw people change their mind on abortion as a result. She had no idea that her local activism would eventually lead to working fulltime in the pro-life movement. Like so many other young people joining the pro-life movement, Vanessa is talented, well-spoken, and passionate. She could do anything with her life, and launch any career. But instead, she has chosen to speak for those who cannot. She has chosen to face the vitriol of the pro-choice public in order to save the lives of children who need desperately need our defence. And in doing so, she is proving by her actions that those precious little babies really are worth it.